which have worked out well so far. Today, we will be talking about another Boult Audio product i.e, Boult Audio Muse. The Boult Muse is another Bluetooth earphone by Boult. So, we have tested the Boult Muse for over a week now, we will be giving you our honest opinion and detailed review of the product. JUMP to yours Desired part of the Review by choosing Heading mentioned below. One pair of Boult Muse Earphones. When I opened the box and take out the earphone, the design of the earphone amazed me. The overall design is pretty good and you will appreciate the look of the earphone at the very first glance. Also, the earphone looks heavy because of its bulky shape but on putting them on they are lighter than expected. The black and red combo gives the earphone a cool look, on the other hand, the fine matte finish gives a premium feel. Also, the Boult logo inscribed on the right earpiece as well as the left earpiece looks very nice. The earpieces come with ear hooks attached that makes them fit perfectly into the ears. The earphone fits perfectly and does not fall off from the ear even while extreme workout, or doing any exercise. This pair of earphones are comfortable and they won’t fall off no matter what, so you can do your workout in the gym or run freely without having to worry about your earphones falling off. The rubber finish of the earphones makes it sweat resistant and even more exercise-friendly piece of tech. However, while I was putting on the earphones, the ear hooks did fit perfectly but, the ear hooks were a little large and poking out a little from above my ear. On the right earpiece, you will find a Multi-functional power button that can be used to control answer/reject/cancel, redial the last call, etc… The volume up/down as well as charging slot are placed on the right earpiece. The built-in mic comes with noise cancellation technology. You might love the look of the Boult Audio Muse as well as its robust material. You can argue a little bit about the price but I wouldn’t mind paying the price for its good build quality and the IPX7 rating that offers the freedom to use the earphone even in rain or sometimes swimming. The chords used here is flat and rubberized making the cords tangle free. When using the Boult Muse for the first time, it sounds cool. If you are familiar with my previous reviews then, you might have noticed that the performance of earphones are not to its maximum potential on its first day of use but, this was not the case for the Boult Muse earphone. However, I still recommend you to warm up the earphones before use as it makes the diaphragm more flexible. The warm-up can be done via playing a song for a long time can say about 4 to 12hrs or else you can download some app from play store. Here is an App with a name “burn-in audio” which you can download the App from Play store. After doing this, the output from the earphone does sounds the same, maybe the company send me an already warmed up earphone as it is a review unit. But, the output from the earphone was loud. It didn’t pain or pinch at the loud but yes I will suggest you not to use any earphone at volume level above 75%. I streamed many songs of various genres(i.e. pop, rock, classical, metal, etc.) in English, Hindi, and Punjabi. Muse did a pretty job in subwoofer but I felt sound wasn’t crystal clear but it’s not much noticeable. The vocals have great clarity so, it won’t mix up with the bass and treble. When compared to Boult Audio Curve Neckband Wireless Bluetooth 4.2 Magnetic Earphone with Mic, the Boult Muse has much better sound quality. Overall Sound performance is quite good with decent treble and micro woofer bass offered around 1.5k under a wireless category. Noise cancellation at low or mid volume is just average but as the volume goes up, upto the full volume, noise cancellation gets little stronger. The Boult Audio Muse is packed with Bluetooth 4.1v for universal connectivity. The Bluetooth range of this headphone is up to 10 meters. So, feels free to roam around the house and enjoy music and take calls without any hassle. It has a great feature of dual pairing and compatible with nearly every device. It pairs easily with any device, by switch it ON. Boult Audio Muse has a couple of voice prompts that make it easier for you to receive calls or lets you check whether the earphone is connected to your Smartphone or not. As Boult Audio Muse is loaded with Bluetooth 4.1v, the connection during the call is great. The voice clarity during a call is loud and crystal clear. It makes aware of the incoming call and by default, the music is paused and let you take calls. When coming to the battery life, The Boult audio Muse offers 10 hours of long-lasting music and 200 hours of standby time. The earphone takes up to 2 hours to charge completely. The Micro USB cable provided in the box is used for charging. Even though somehow, it runs out of battery, here is our list of Top 5 Best Power bank under 1500 Rs in India. Connecting the Boult audio Muse earphone to a smartphone is quite easy. Press the multifunction power button(which can be found on the right earpiece) until the LED present on the right side of earpiece turn blue then pair it with the smartphone. Every time you will get the LED notification along with a beep sound notification on switching on/off BT device or getting connected/disconnected BT device with the smartphone. The Boult Audio Muse is a good pair wireless earphone. 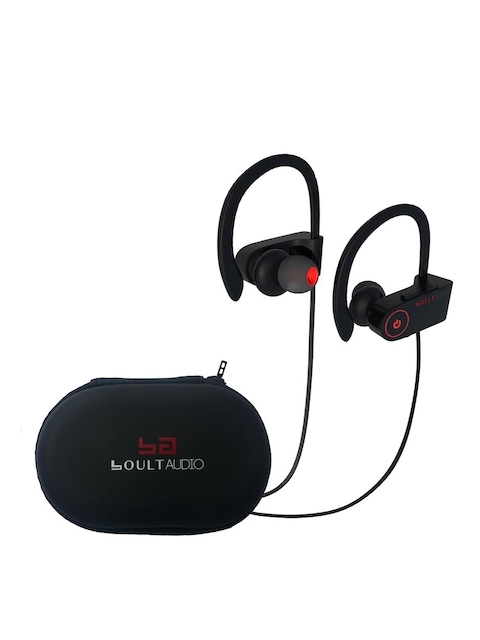 This earphone is excellent for those who do exercise, jogging or other fitness related workout. It is sweat resistant as well with an eye-catching design. At the same time, it offers quality sound experience to the users with a continuous playback time of around 10 hrs. But, Hey! we leave the final decision up to you if you are willing to buy it or not? Noise cancellation could have been better.